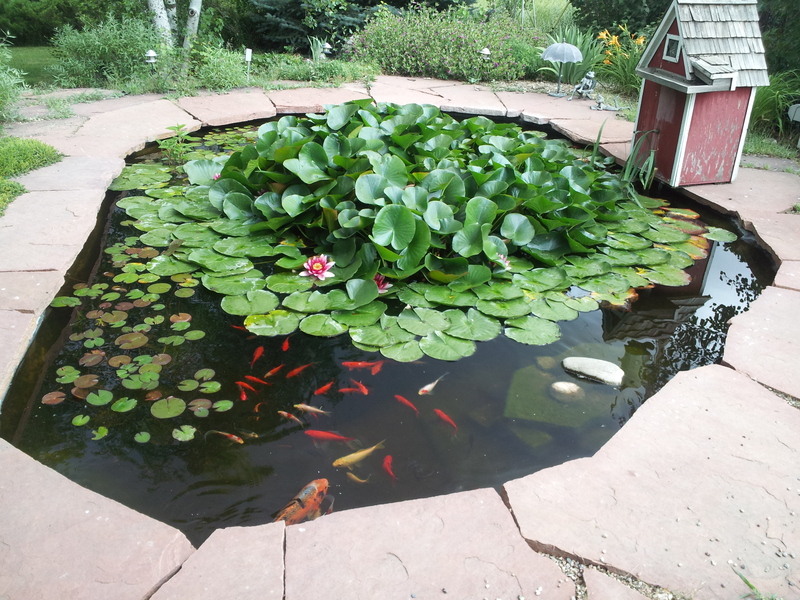 Lila and Garry Howell’s water garden, and koi, thrive despite Cheyenne’s climate. Photo by Lila Howell. A water garden sounds too exotic to be true for Cheyenne. But I saw one last summer full of water lilies and swimming koi. Lila Howell and her husband, Garry, have had one for 15 years. It’s the centerpiece of a little, tree-filled glade next to their house, which is just a few miles beyond the eastern edge of Cheyenne. Lila, a longtime master gardener and garden club member, likes a challenge. But a water garden is only as challenging as you make it. Water lily. Photo by Barb Gorges. Like any garden, you’ll want to have it where you can enjoy it, close to the house, even visible through a window. The farther any garden is from your door, the more likely it is to be neglected. A water garden is essentially a pool. It requires access to a water source as well as electricity for a pumping and filtration system. A semi-shady place like Lila’s is nice—it cuts down on evaporation, meaning she only tops off the pond every 10 days or so during summer heat. But with shade comes tree leaves falling in the water and they have to be removed, Lila said. Also, Lila pointed out, don’t put the pond in the path of natural drainage, where rain and snow melt flow, because unwanted stuff will wash in. The pool for the Howell water garden is an irregular shape, about 13-by-18 feet, and a depth of 4 feet. If you don’t plan to have fish, it could be much shallower. Because of the contours of their property, the Howells actually brought in dirt, but arranged it to leave the depression for the pond. Whether you arrange dirt by shovel or backhoe, Garry recommends using a plate compactor to compact the dirt. And be sure there are no sharp objects sticking up anywhere. To be sure nothing sharp punctures your pond liner, use carpet pad under it. Old padding is fine. Some people use sand. Any container that can hold water can become a water garden, perhaps an old whiskey barrel that’s been waterproofed. With just the addition of an aerator and a water lily, you can dress up your deck. It’s essential to seal the bottom and sides of the pond. Replacing water that seeps out would be expensive, especially if the pond is near your house and the seepage finds your basement. Concrete is not desirable because it cracks as it ages. Lila said sometimes roofing material is used because it is waterproof, but she said it kills fish. She likes her koi. They are fun to watch and they eat any mosquito larvae. She said she and Garry were able to order a custom-sized pond liner from www.pondliner.com, and 15 years later, it’s still working. The company also carries standard sizes. One that is 15 x 15 feet square runs about $150 today. The website, and others like it, carries just about everything you’ll need for a water garden or fish pond, including the fish. Lila and Garry have edged their pond with flagstones which protect the edge of the liner. Also, by having the flat stones jut out a bit over the water, animals that might want to eat the koi are kept out. The ledge doesn’t perturb the Howell’s dog, however, as it likes to soak in the pond on hot days. So they have built an underwater ledge to help it climb back out. There’s no access to dirt in the bottom of Howell’s lined pond. Instead, water plants grow in special perforated baskets full of our regular old heavy clay garden soil. Regular potting soil has a lot of light-weight materials that will float away. Lila adds a layer of pea gravel to the top of each basket to keep the dirt in and the fish from nosing the dirt out. 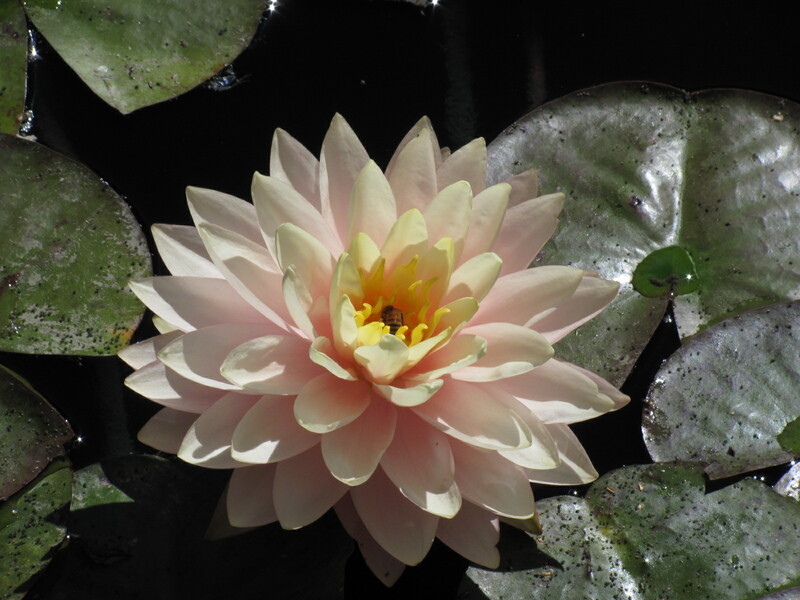 The first couple years, Lila brought the water lilies in each winter. But it was too much work. 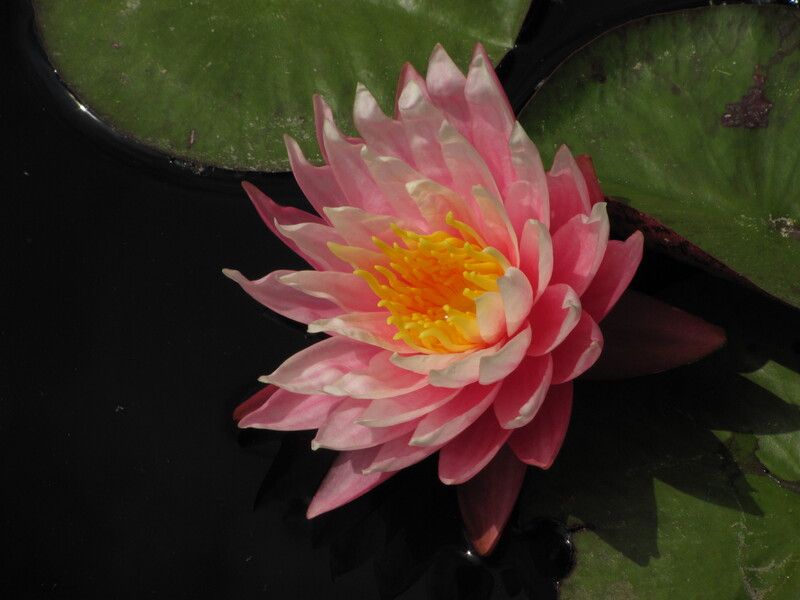 Since she had chosen to grow hardy, rather than tropical, water lilies, she finally tried letting them over-winter in the pond and they have been fine. Just as the fish can stay low enough to avoid ice forming on the surface, the water lilies’ main growing points are protected too. Lila also has frog bit, with tiny leaves and flowers, and Louisiana iris. But she didn’t want cattails because their roots would puncture the liner. Water hyacinth is invasive in lakes and streams in other parts of the country and it is illegal to grow it those places, but not Wyoming. However, Lila found her water garden was too cold for it to thrive so she quit buying annual replacements. In some ways, a water garden with fish is a cross between a swimming pool and an aquarium, except chlorine is bad for plants and fish. Housed in the quaint miniature cottage Garry built at the side of their water garden is the filtration system. Water from the pond is pumped with a 1.5 horsepower pump past a filter and a UV light to kill microorganisms. In the winter, only the pump is running, bubbling the water to keep the koi supplied with oxygen. Every winter there are a couple weeks when Lila plugs in the tank heater, the same thing ranchers use to keep livestock water tanks open. It helps the pump keep an opening in the ice for the fish. Lila recommends vacuuming up the muck in the pond in the spring and keeping up with it during the growing season, maybe twice a month during the summer. Skimming fallen leaves needs to be done, otherwise when they decompose they steal oxygen from the fish. Algae blooms seem to run in cycles, starting with one in the spring. Garry can put on his waders and get in and clean things up, including dead plant parts that sink to the bottom. Lila has found the more plants she has growing in the water garden, and the more of the water surface they cover, the less of an algae problem she has because the plants take up the excess nitrogen the algae needs. You must also be careful about yard maintenance adjacent to your water garden, Lila said. Fertilizer and weed killer will kill your plants and fish. 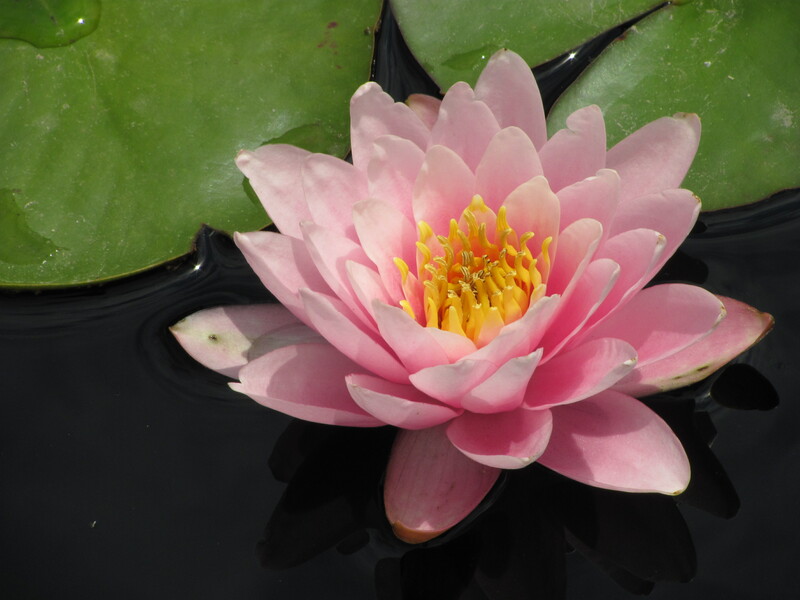 Depending on the weather, the water lilies begin to sprout in April and begin blooming mid-May and on into October. They come in dark pink, light pink, white and yellow. Each flower blooms for three to four days, closing at night. At the time of my visit last August, the day after a hailstorm, the big water lily leaves looked a bit tattered, as well as the flowers that had been blooming. But Lila said not to worry, the leaves quickly regenerate and the tattered ones sink away, leaving her and Garry once again with their very own Monet water lily painting. Categories: Uncategorized, Water garden | Tags: Cheyenne, fish pond, gardening, koi, pool, water garden, water lily | Permalink.